A SUSPECTED cannibal couple lured victims using dating sites before drugging, butchering and eating them, it has been claimed. Dmitry Baksheev, 35, and his wife Natalia, 42, have reportedly confessed to killing at least 30 people in Russia over two decades. Cops fear Natalia may have also fed human meat to student pilots in the Krasnodar military academy where she worked as a nurse. The couple were arrested after the dismembered remains of a young woman were found in the academy next to a bucket filled with body parts. Dmitry admitted the grim killing and boasted about multiple other murders after a phone was found with pictures of him allegedly posing for selfies with dead bodies. Investigators are seeking to verify the claims after seven bags of body parts were found in their fridge and freezer. A jar with pickled human remains and 19 slices of skin were also discovered in the macabre flat. Hillary Clinton said Monday on Bloomberg News that President Donald Trump has "tendencies toward authoritarianism," adding that she hopes he has not "ordered the killing of people and journalists" as Russian President Vladimir Putin has been accused of doing. During a conversation with Charlie Rose, she compared Trump to Russian President Vladimir Putin, whose relationship with Trump has particularly drawn scrutiny from Democrats and the media. Clinton discussed her ideas on Trump's view of democracy, saying she "hopes" the president is not exactly like Putin in every way. Internet could not load the webpage because www.discussionist.com took too long to respond. The website may be down, or you may be experiencing issues with your Internet connection. Every hour or so, a taxi pulls up at the end of a remote country road in upstate New York and deposits another load of anxious and weary passengers. From here, it is steps across a gully to the Canadian province of Quebec, where police stand ready to arrest anyone who enters illegally. Undeterred, the travelers drag their suitcases across a makeshift dirt bridge, past a sign that declares in French and in English, “No pedestrians,” and surrender to the waiting officers. They are part of a surge of asylum seekers from Haiti, Sudan, Turkey, Eritrea and beyond who have been streaming into Canada in recent months, hoping for refuge they believe will be denied them in the United States. A very safe area of the Florida Peninsula. "We've missed a direct hit for the past 100 years." We've missed a direct hit for the past 100 years. This may be of little consolation by Monday, but historically, Sarasota and Bradenton, as well as Tampa Bay, have been among Florida’s safest places from direct hurricane hits for the past 100 years. 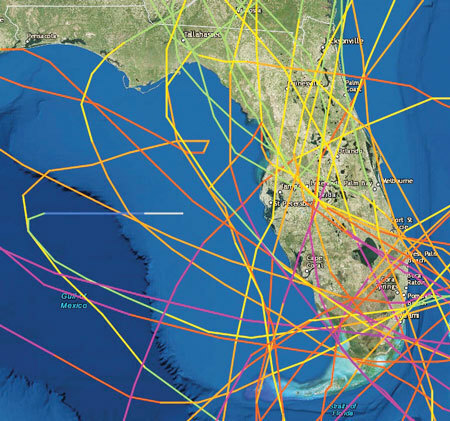 The accompanying map, a product of the National Oceanic and Atmospheric Administration, shows all of the Category 2 and higher hurricanes that have passed through Florida in the past 100 years up to 2015. The darker the color, the higher the category. At the end of June, California was set to start enforcing a law that America’s gun owners are routinely assured that “nobody, anywhere is proposing.” Had the state not been prevented from implementing the rule by a sensible federal judge, an extraordinary precedent would have been set. The law to which I am referring, passed by state-level referendum in 2016, requires the confiscation of all firearms magazines that can hold more than 10 rounds—even if those magazines were purchased before the ban. Or, put another way: Having promised gun owners in 2000 that their now-illegal-to-sell property would be safely “grandfathered,” Californians elected brazenly to renege on the deal. Under the terms of the statute, law-abiding Americans would have been obliged to destroy, hand over or transfer out of state their now verboten property. And if they refused? They’d be guilty of a misdemeanor, and their magazines would be taken by force. The answer, perhaps, is this: We are suspicious because it is abundantly obvious that for too many gun controllers, this is the ultimate aim. And it is clear that, should it come, it will come in stages. As history has taught us well, the enemies of individual liberty never openly suggest the worst-case scenario until, all of a sudden, they do. And by then, it is invariably too late, for the road has already been traveled.